Most if not ALL of the items I design on a daily basis are proprietary which means I cannot share the models with the public. One of the goals I set this year was to create a complex model in SolidWorks that I COULD share with the SolidWorks/CAD Community. Over the years I have picked up countless tips and tricks by downloading models and presentations from Paul Salvador, Ed Eaton, Mike Wilson, & Matt Lombard just to name a few. In my mind it was definitely time to give back to the community and share one myself. Sometimes inspirations come from the strangest places. 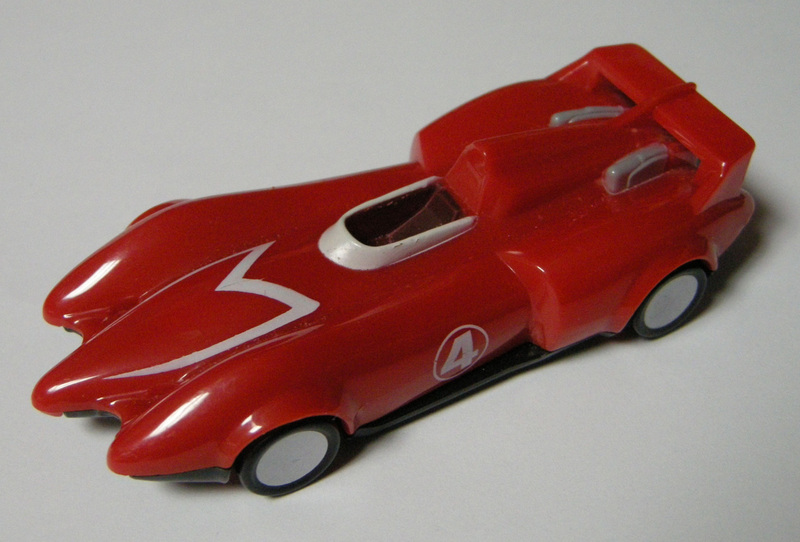 When the Speed Racer Movie came out early this summer, my son got this really cool looking “Matchbox” size car in one of his Happy Meals. 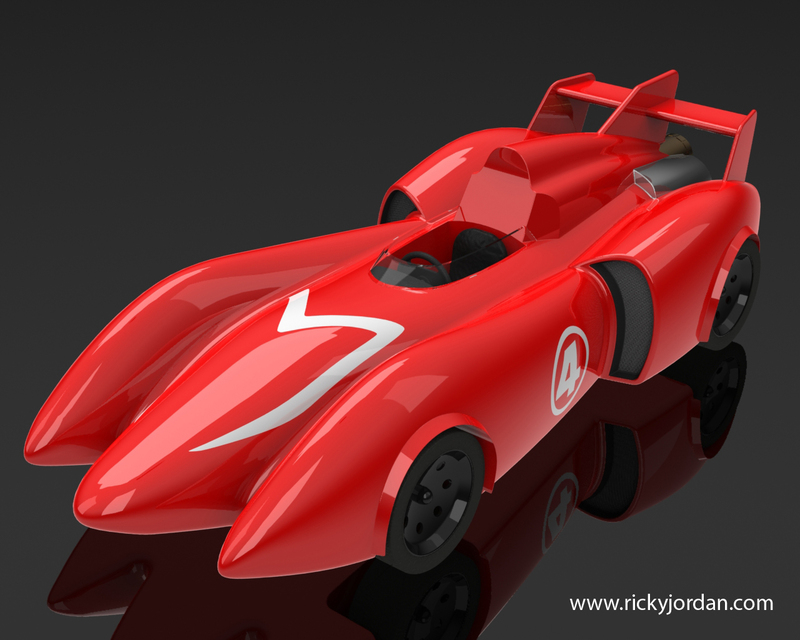 It was the Mach 4 Racer that Speed Racer’s brother Rex drove at the beginning of the movie. As he was showing it to me I started looking at it thinking to myself, “That would be a cool car to model in SolidWorks.” I took a few pictures of the car (I was at home and didn’t have access to my NextEngine Scanner) to give myself a bit of a head start by using the Sketch Picture command. When I started modeling it I wasn’t really sure where I was going to go with it. The toy was a bit crude in a few places, so I made up my mind early on that I was going to detail the model a bit more vs. the toy car. I was able to grab a few screen shots of the car in the movie preview and quickly saw there were seemingly endless boundaries for the amount of detail I could put into the model if I had the desire and TIME to do it. With my hectic schedule, the Blog, the SolidWorks User Group, and doing the Technical Editing for the SolidWorks 2009 Bible, I quickly realized I was probably not going to be able to detail the model just like the car in the movie or to the level that Mike Wilson did on his “original” Speed Racer Mach 5. If you haven’t checked out Mike’s model, I HIGHLY encourage you to do so. I had the model about 75% complete when SolidWorks 2009 Beta rolled around but I had to put it on the shelf for a while. I did sneak in some time to get it complete enough to include in my new Blog header. Over the last two weeks I finally found the time to finish it out to a level I was satisfied with. My hope is that those of you out there who want to learn more about surface/complex modeling will find it useful. With that I am proud to announce that the models have now been posted for download (the links are down further). Rob Rodriguez will be featuring the Mach 4 Racer in his November PhotoWorks Rendering contest. In case you are not familiar with his contest, users download the contest model and submit images rendered with either PhotoWorks or PhotoView 360. Rob posts all the entries on his site, and then everyone votes for their favorite! The winner receives a prize. I challenge you – my readers to SUBMIT YOUR ENTRY! Remember it doesn’t take as long to render models as it used to now that PhotoView 360 is on the scene. I’d love to see a record number of entries in Rob’s contest. Make sure you visit Rob’s site for all the details on the contest. I hope you enjoy the model. It was alot of fun to create and also presented some good challenges along the way. Stay tuned…..more to come! dude, I was SO right. Do I win a cookbook? btw, why can't I leave a video comment?? I promise I'll put a shirt on. I didn't realize that I had to enable video comments in DISQUS. It is turned on now so fire away! LOL!! Cool beans! My first video comment! 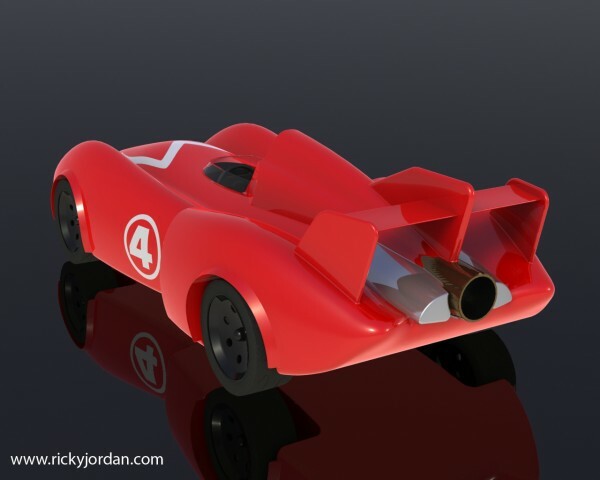 can you tihs mach 4 racer's modeling video send to blog? I have a sw 2008 user. OK I have finally downloaded your car model to show to my sons. Maybe make them a 3D print of this. Have you considered adding a Creative Commons license to your work? This is kind of like Open Source for designs and other non-computer-code intellectual property. It encourages others to re-use and extend your work, but retains your ownership as a creator of the work. I briefly touched on this during my user group presentation in Knoxville. Personally I think this is a trend that will grow in the mechanical design and electronics industries. Hey nice work on the car model! Thanks for your nice comments on the Mach 4. It was a lot of fun to create and I hope it can be used as a tool to help other users in learning to create complex shapes. It's funny you mentioned the Creative Commons License. I have taken over webmaster duties for my wife's Cooking site (http://www.southernplate.com) and we were setting up a Creative Commons license for her site the other night. Getting one on my site was on my list of things to do this week. I just got it placed tonight. Thanks for the reminder! Let me know how the 3D print turns out if you make one. See you at SolidWorks World! I'm glad you like it! I'm already planning my next model to build….now I just have to find the time to do it! I would like to make this into a tattoo on my arm, would that be ok? Wow, I am so excited to find this post. I'm going to look into it because facebook is quickly taking over everything.